I took a chance and pruned it back quite a bit, at least two feet. I don't know if you can tell me what varirty or give me any information on it from these pictures but any help is allways greatly appreciated. Last edited by brian on Thu Apr 17, 2008 8:34 pm, edited 3 times in total. Dogwood should be cut by one third to the ground each year (2-3inches from the ground) to get the best from them. Some are best if completely coppiced and some you will lose catkins and flowers if you do this so by doing the one third you cannot go wrong. If you can poist a picture or give me a description I may be able to tell you which you have. Are you sure that is a dogwood? It looks like Euonymus fortunei to me. 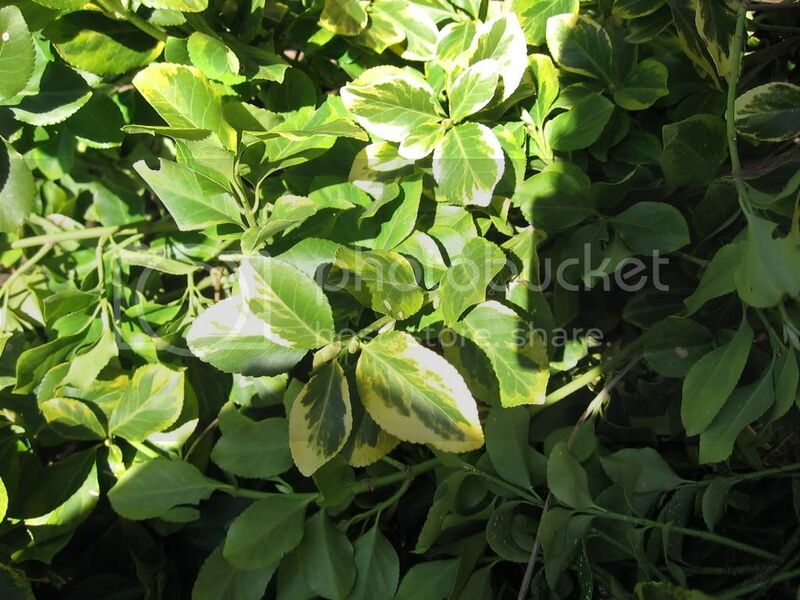 There's a Cornus alba out there that does have variegated leaves. The Siberian Dogwood has very distinct red twigs though. MaineDesigner nailed the ID on your plant. I am also thinking about removing the two trees and replacing them with something else because they are a bit nasty looking unless anyone has a suggestion on what i can do yo make them look a little nicer and healthier? God Bless, Brian. No, not over your head which is why I teased with you. 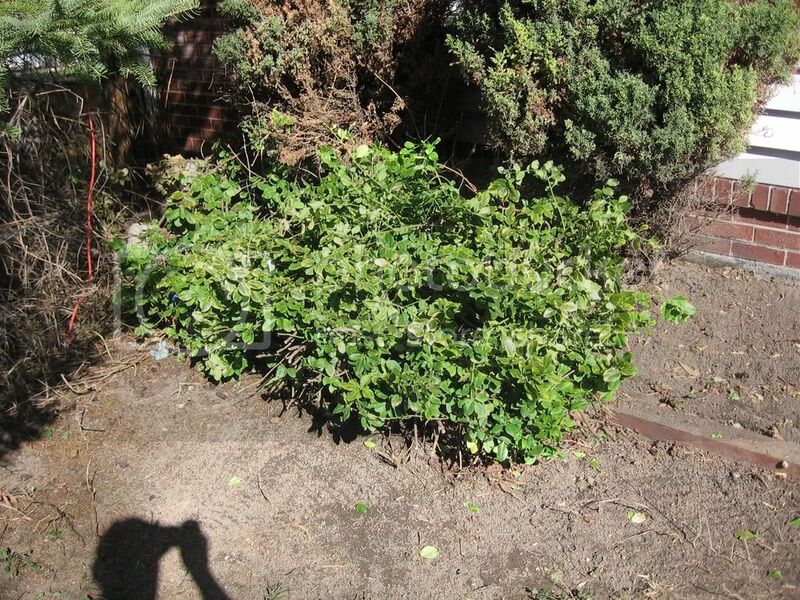 I'm sure you've gone online already and know the Siberian Dogwood and your Wintercreeper are both invasive species that have naturalized in your area so even if you did trim that Euonymus to the ground it would still come back. Some children never crawl before walking... some gardeners, such as yourself, are a lot like those children. I suspect because of your openness to new concepts and your willingness to be a good steward to the land that you will blow your peers out of the water in a very short period of time! Way to go Brian! I caught that you are thinking about removing the Euonymus. Which two trees are you thinking about removing? Maybe people here can come up with a few suggestions for replacements or a few suggestions to make what you have less nasty looking. By the way, what do you mean by nasty looking? Thank you so much for the words of inspiration they mean more than you could know. The trees that i am speaking of are the two evergreens if that is the right term, behind the Euonymus. They are always kind of brown and they are forever filling the garden with sharp needles. You are right about the invasiveness of the Euonymus, i just never noticed how bad it was before. I am thinking that the solution is to start fresh by removing all three before they become a problem for all the other plants and ideas that i have. Any suggestions on what might look nice in thier place would be greatly appreciated. I postedanother picture of the same area under "north facing trellis" God Bless and have a great day. P.S. I don't know what the weather is like where you are right now but it is finally really nice here and I am thinking gardening! I am thinking that the solution is to start fresh by removing all three before they become a problem for all the other plants and ideas that I have. And this statement my friend, sums up exactly why I commented about you as I did. Few have the foresight to realize it is much easier to deal with many problem plants before they spin out of control creating an even bigger problem than they already do. The "one more won't make a difference" mindset takes a toll on us all. Conifers aren't for everyone, that's for sure. May I please have a link to where your photos are posted and will you also please tell me what county you garden in. Then give me an idea of what size tree you are looking for as well as what function you want it to perform. As far as arranging anything or making your property look nice, count me out. I have no design sense. Weather is great. Up into the 60's so I've been out in the greenhouse on and off this morning re-potting and watering. There is some life out there even after so many visits from Mr. Mouse and all his kinfolk. Does look as if it's going to rain so I'd like to get over to the north side of the house for a little bit to start spring cleaning in that area. I always leave it to last because it frustrates me. You don't by any chance know where I could buy a few bareroot or small Photinia melanocarpa (synonymous with Aronia melanocarpa) do you? I really want to stick a few on the north side of my house by a down spout. Okay I checked, Conecticut, sorry. And I see that it is in the north east region of the U.S. and I believe youare mid-west? so it is probably closer to me than to you. With that in mind I will check around to see if that species is available here, oh bye the way it is a very nice plant! Oops, I forgot you were from north of the border and it was right there in front of my face. No, you're not being rude in the least for reminding me where we're from. Obviously somebody has to do it! I've got the permits to import plant material but I'm not in the mood to pay for a phytosanitary cert. Those phytos are expensive! I'll poke around in my area a little bit more. Ideally, I'd like to pick up a few that I want for that north area from the same nursery to save on shipping costs. You misunderstood me, I was talking about bieng rude for not knowing how to spell Connecticut or knowing U.S. geography, it has been a long time since i was in school. Anyways good luck with yourgardening. God Bless, Brian. here is a picture of the trees i am thinking of eliminating. any suggestions for replacements? Today is a great day so make the most of it! Thanks for the giggle over the misunderstanding. You were anything but rude regardless of what your intent was and Lord help me trying to spell Saskatchewan! The conifers are anything but nasty looking to me but... beauty is in the eye of the beholder and I like conifers. Hey! That's the front of your house which you said was a northern exposure. Why not try a few of the ones I listed above that I'm either already using or considering? The conifer seems to be out of proportion with your home being a ranch style and those other conifer thingies are now blocking your view from your front window. 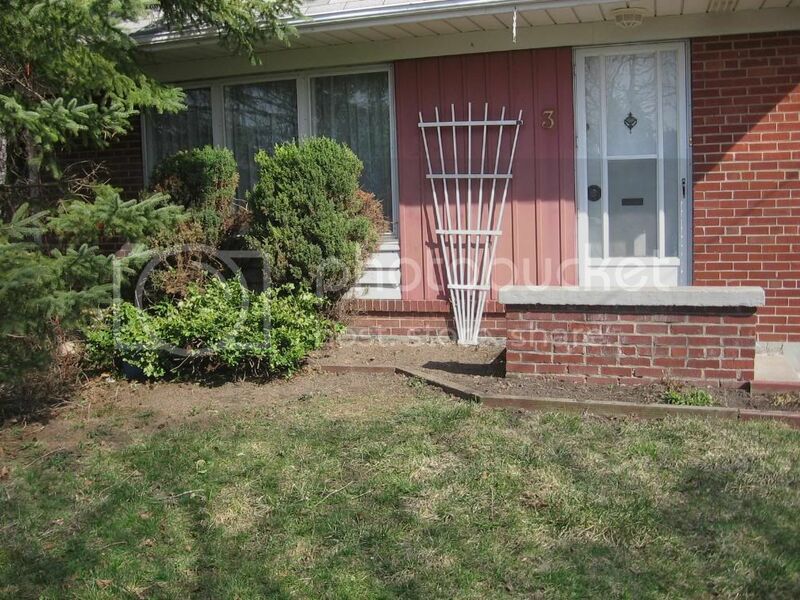 I love that brick pier in front of your door. Have you seen those plastic planters that are long and narrow that they sell at garden centers? I've seen them in white that would match the trim on your door and your white trellis. Wonder what could be planted in one of those long skinny planters that could be placed on that brick pier? I have a hummingbird feeder outside my front door. It's on a shepherd's hook. I love it. I constantly find myself watching the hummers visit that feeder. I think you might really like a hummingbird feeder in that area. I also have a chipmunk feeder outside my front door. It's a glass juice jar strapped onto a chunk of wood that the squirrels can't get into. I used an old belt that one of the kids had grown out of to strap it down to the wood using a staple gun. I love watching the chippies go in to gorge. If you have any chippies in the area, they will find you if you put out sunflower seeds. I must tell you that you will find sunflowers sprouting in pots though if you do this. They're easy to pull out though. There are some really nice Viburnum cultivars that are dwarfs that could be used in front of your windows and I think 'Compacta' is one of them or maybe it was 'Alfredo'. You lucky duck you! That's a great looking native plant nursery and it might even be close to you. We have no more native plant nurseries around me. I just finished checking out all of the trees you suggested. Thank you for all of your suggestions. Many of the trees you suggested seem like they are a litte large for what i am trying to accomplish unless i should be looking at them with a bonsai mentality wherre they can be shaped and thier heightcontrolled. 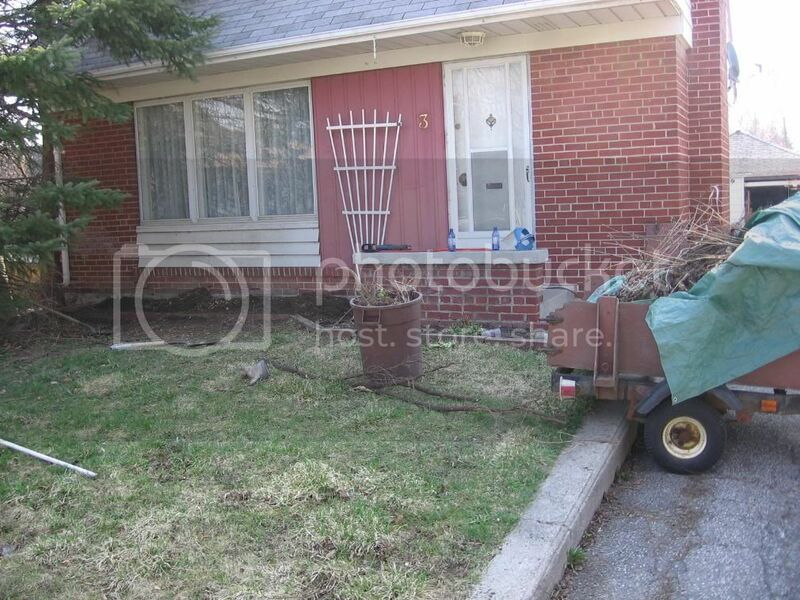 I made the drastic decision yesterday to clear out the front of my house (I feel it today) I have attached a picture so you can see the damage i caused. Time to start fresh! I really liked the Vibernum cultivars that you suggested and i am also considering replanting some dwarf evergreens under the window? Oh bye the way you might find this amusing. After taking a compass to the front of my house I realized that my house actually faces exactly northwest, imagine a person from "the true north strong and free" as our national anthem puts it not knowing where true north is . So I get more sun than a true north exposure would get. God Bless and have a great day!